The 2,300 children who have been taken from their parents face a tangled legal process and a shortage of lawyers to help them through it. On Monday, Border Patrol agents at a detention center in McAllen, Texas, took away the son of a woman from El Salvador, whom I’ll call María. Afterwards, according to Efrén Olivares, a lawyer for the Texas Civil Rights Project who spoke with María on Thursday, she and her son were kept in separate chain-link pens at the same facility. She saw him once during that time, from across the huge processing center, which is sometimes referred to as the “dog kennel.” Officers told María they had to separate them because she was going to federal court to face a criminal charge of illegal entry. But when María got to court on Thursday morning, federal prosecutors dropped charges against her and 16 other immigrant parents who’d also been separated from their children. It’s not clear why the charges were dropped; the Department of Justice did not respond to questions. It’s tempting to see it as a sign of good news, perhaps a signal that the executive order that President Trump signed Wednesday evening is encouraging prosecutors to use discretion, softening the “zero-tolerance” policy that has led to thousands of family separations. Instead, that job has largely been left to lawyers like Olivares. On Thursday morning, he and other attorneys met with the 17 parents whose charges had been dropped, and tried quickly to gather names, birth dates, and other identifying information about their children. The parents were exhausted; María couldn’t stop crying. Some had hoped they would be reunited in the courtroom. “They ask me, ‘How long before I see my child again?’ and I tell them I can’t lie, I don’t want to lie—I don’t know how long exactly,” Olivares said. Over the last month, lawyers for the Texas Civil Rights Project have talked to more than 380 immigrant parents in courtrooms in McAllen whose children have been taken from them, in an attempt to ensure that there is some documentation of the separation; it’s unclear whether and how the government is tracking them. Other than one child who was released to a relative, they have not been able to confirm that any of those families have been reunified. “It’s insane,” Olivares said. María will now go to a detention facility as her case works its way through an immigration system that is increasingly hostile to asylum seekers. Her son is now considered “unaccompanied” by the government, and will be treated as if he’d crossed the border alone. That means he’ll go through a separate legal process from his mother, and he’ll need his own immigration lawyer in order to make a plea for asylum. Immigrant children do not have a right to legal counsel, and even before the number of family separations shot up there was a shortage of pro bono lawyers to represent children who’d crossed the border on their own. 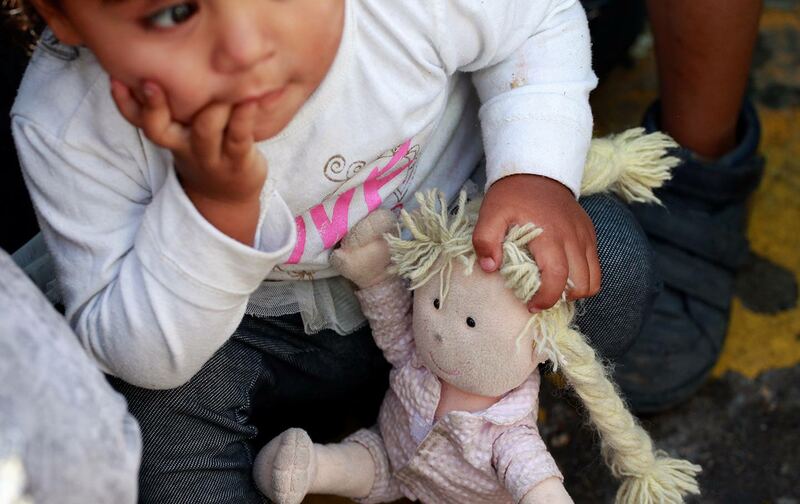 Megan McKenna, the senior director of communications for Kids In Need of Defense, which represents unaccompanied and separated children, said that 60 percent of unaccompanied children previously did not have access to an attorney. “You can only imagine how many more will not have attorneys as a result [of family separations],” she said. “They have to represent themselves through an incredibly complex immigration system, which is absurd.” If parents can’t be located, children may lack crucial information supporting their asylum claims. “The parent often is the one who knows the reason that the family came to the United States. Often the child just doesn’t know, or the child can’t articulate it. The parents have the documents and the supporting evidence,” McKenna said. Nine out of 10 children without representation are ultimately deported; children with attorneys are five times more likely to be successful in claims for asylum or other legal relief, according to McKenna. McKenna described the reunification process as “chaos.” She continued, “We’re trying to figure it out, but every day things change. There was no plan, and there still is no plan.” Parents have been given an 800 number to call, but that’s “a black hole, as far as we can tell,” said McKenna. Parents say they’re put on hold for long periods of time, but because they’re calling from detention centers, they have limited time to wait.